Japanese mobile operator NTT Docomo has released a light-hearted video to promote the launch of LTE Advanced (LTE-A) networks in the region. LTE Advanced (LTE-A) is the next major step in the evolution of our LTE networks, expected to help network operators meet the massive increases in mobile data demand, and deliver much higher data speeds for all users through greater stability and faster performance (LTE-A is expected to be at least twice as fast as most 4G networks today). NTT Docomo’s video uses extreme cooking to illustrate how LTE-A works and the speed improvements that can be expected. That was fun, but seriously how does LTE-A work?! LTE-A, like LTE, uses multi-antenna techniques such as MIMO and diversity but it also takes advantage of carrier aggregation and more advanced coding. Multi-antenna techniques (MIMO) – MIMO is used to increase the overall data rate through the transmission of two (or more) different data streams on two (or more) different antennas – using the same resources in both frequency and time, separated only through use of different reference signals – to be received by two (or more) antennas. The first release of LTE-A uses 2×2 MIMO (the current standard, as with LTE) but later versions will use 4×2 MIMO. Carrier Aggregation – Carrier Aggregation enables greater speeds because it allows the transmission of data from multiple channels at the same time. It aggregates different channels on different frequency bands or within different bands. For example you could aggregate 10MHz bandwidth from the 800MHz band with 10MHz bandwidth from the 900MHz band, doubling the data rate. On the first release of LTE-A you will be able to aggregate two channels, but in later releases you will be able to aggregate more channels giving even greater speeds. “LTE” is a broad term. 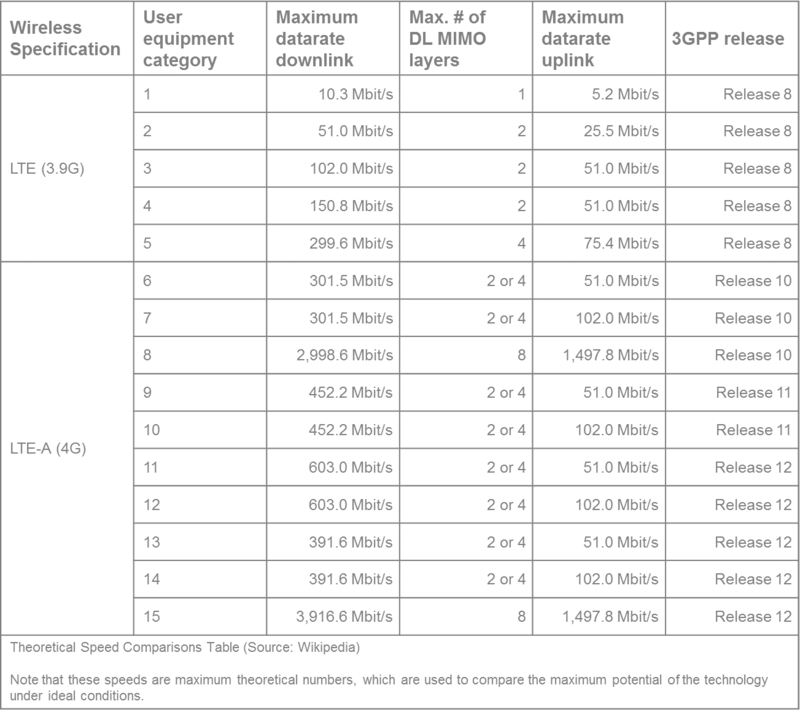 In order to differentiate between LTE evolutions, the industry uses different LTE Categories to describe the LTE network capabilities. From a consumer perspective, they mainly differ in terms of theoretical speed. When is it coming and will this make my onboard Internet redundant? Several countries, including France, Germany, Russia, the UK and the US, already have trial LTE-A networks but a full roll-out will take time, maybe even another couple of years. Will this make your existing onboard mobile Internet solution redundant? No! Smartphone users will not be able to take advantage of LTE-A, they will continue to suffer the same issues associated with cellular handover while on the move (interrupted sessions and dropped calls). Smartphones, tablets, laptops will continue to rely on the provision of passenger Wi-Fi to take advantage of the benefits of LTE-A so an onboard Wi-Fi solution is still the best way to meet passenger expectations. Ultimately, the availability of LTE-A will make your onboard Wi-Fi even more successful. Since Icomera’s technology makes intelligent use of multiple cellular carriers from multiple operator networks at the same time in parallel, the addition of LTE-A simply improves the performance of our solution, delivering all of the available bandwidth to your moving vehicle while passengers not using the Wi-Fi hotspot will struggle to even connect. The unavoidable truth is that all technology dates. That’s why we always advise our customers (vehicle manufacturers and public transport operators) to invest in a flexible solution that allows them to easily add, remove or upgrade key components, for example modems, keeping their onboard technology up-to-date cost-effectively. Keeping pace with developments like LTE-A and, further down the line, 5G (higher grades of MIMO, more Carrier Aggregation, new frequencies/spectrum and base station beamforming) will extend the service-life of their passenger Wi-Fi. How can I ensure that I’m ready for LTE-A? Technology procurement is not a traditional area of expertise for vehicle manufacturers or operators. We take it upon ourselves to advise our customers on where the technology is heading so they invest in forward-thinking solutions. For example, we have been specifying LTE-A-ready antenna solutions ahead of the network roll-outs because we appreciate that they represent a significant capital outlay for our customers, so need to be technologically relevant for many years. Icomera works with a variety of technical and academic partners, including Ericsson, KTH, Chalmers and Sierra Wireless, to ensure that we are always a step ahead when it comes to technologies that support better connectivity to vehicles. Our expertise in this field allowed us to design, test and bring to market a multi-radio mobile access and applications router that already supports the increased bandwidth that combining multiple LTE-A networks offers, ahead of our competitors. The Icomera X6i provides the necessary processing power and onboard memory required to deliver the next generation of mobile connectivity solutions for public transport. When LTE-A is ready, our customers will also be ready.